New budget has army at smallest size since 1940, shunning traditional wisdom to prepare for two simultaneous conventional war fronts. The US is set to cut back its army to the smallest it has ever been since before World War II. 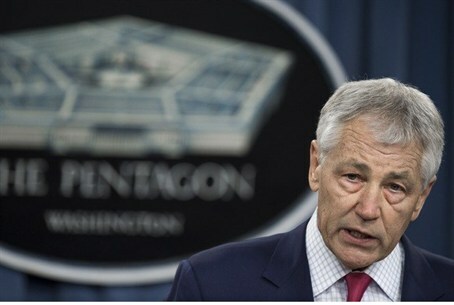 Pentagon officials described the details of US Defense Secretary Chuck Hagel's new budget before its release Monday. According to the US Department of Defense, during World War II there were six million active duty military personnel in the US army. Given the new cuts, the US army will go down to 440,000-450,000 personnel, making it the smallest ever since 1940. In addition, an entire class of Air Force attack jets will be eliminated under the new plans. Hagel's proposal also has financial implications for soldiers, setting a limit on pay raises for soldiers, higher fees for healthcare benefits, and lowered allowances for housing subsidies. The proposals are intended to scale down and modernize the US army, keeping the military well-equipped and trained, while removing the size and capabilities meant for engaging in land wars on two fronts simultaneously, according to the New York Times. “You have to always keep your institution prepared, but you can’t carry a large land-war Defense Department when there is no large land war,” a senior Pentagon official said. While the shift would see the US army less able to maintain a prolonged land operation in foreign territory, the budget designates money for Special Ops forces and cyber warfare, showing a new emphasis of the military. While traditional military wisdom emphasized the importance of having a large enough army to simultaneously fight two conventional wars, Hagel's plan follows more recent budgets and strategies that argue for an army capable of winning on one front decisively while keeping a second conflict at bay. Many military experts agree that with the end of the era of "conventional", industrial-scale warfare, and a new focus on counterinsurgency and counterterrorism, militaries should adapt by becoming smaller and more agile. However, not all are in agreement, Just last November, Senior military analyst Lt. Gen. Thomas G. McInerney warned that a rising Russian and Iranian influence, coupled with America's waning Middle East presence, has put the US in the most dangerous situation it has been in since prior to World War II.